It was the most unlikely of places—Greenwood Cemetery in Brooklyn, an autumn afternoon last year, sitting in a yellow children’s school bus while fellow architects straggled back from our trek among the tombstones, where we were getting learning credits for our architecture licenses. I didn’t know a soul. Greenwood Cemetery—A Trek Among the Tombstones: Architects getting credits for our licenses wander the Cemetery with a guide. And then it happened. “Kevin?”—and with the sound of that voice I was pulled out of my graveyard reverie. How could I forget Emily, who would make all of us laugh in the middle of the night when the class, en masse, was pulling an all-nighter for a presentation the next day? 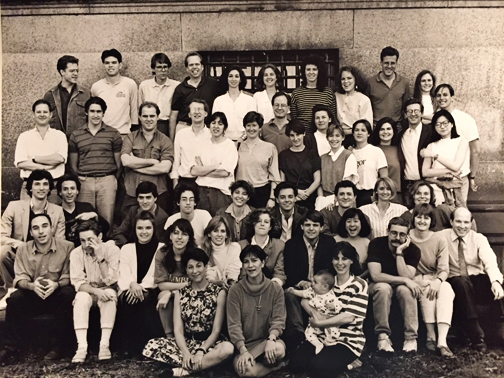 Dazed and Confused, the Class of ’88—Then: Here we are 30 years ago, near “The End,” for an impromptu photo shoot outside Avery Hall where the Columbia University Graduate School of Architecture, Planning & Preservation is located. We caught up, chatted, and then Emily said if Columbia sends out anything about a Reunion—May 2018 would be our 30th anniversary—she was going to try to get our classmates together, apart from the organized Reunion festivities. A week later, in some cosmic crossing as if directed by Emily, Columbia sent out an email announcing a 30th Reunion for the Class of ’88, the only time in 3 decades any of us was invited to one. The Organizer: Emily, who organized EVERYTHING after a chance encounter in a cemetery. Emily immediately kicked into gear, tracking down emails, calling classmates she hadn’t spoke to in decades, and sending out email missives to gather the troops. An email list appeared, and I stared at the names. I conjured up those youthful faces of 30 years ago. And then the emails started pouring in from my classmates, with stories, with links to their websites, with promises to come to the Reunion, or regrets that they couldn’t make it, each sincere and heartfelt. Earlier this month I watched in awe—and utter delight—as the machinery that Emily set in gear last fall, rolled over us. People from Seattle, San Diego, Paris and even Dubai flew in for the weekend. Speed Dating? : The DUMBO rooftop is a whirl of motion as my classmates move from one to another catching up. Spouses were invited and several joined the revelry. Our host’s husband even cooked the Columbians hot dogs. Saturday night of Reunion weekend, about half of my 60 classmates stood on a rooftop of a spectacular new building in Dumbo, having drinks, catching up and enjoying a barbecue that another classmate hosted, all the while gazing at the East River, the bridges, Manhattan across the way, amidst one of the most spectacular settings in the world. It was a perfect June evening, with a stiff breeze coming off the East River. Seeing them all was pure delight. I spoke to everybody! Delirious New York: The rooftop view from 1 John Street in DUMBO, where we gathered for a BBQ. Could there be any better place to get together on a perfect June evening? What was astonishing was the stories that were told, the lives lived, and the sheer talent and accomplishment of my peers. Many had started small boutique firms and were doing residential work, much like myself. Others worked for large firms, and had risen through the corporate ranks. Several chose an academic life and taught at universities and colleges. Perhaps those were the expected stories. Class of ’88—Now: We gather with all of Manhattan as a backdrop. Older and definitely wiser! Others chose not to practice architecture at all—or left it after a time—like Emily, who got a law degree. My good friend Marcantonio started a terrazzo company after working at I.M Pei & Partners a few years, and now has an international operation that stretches through the Middle East to the Far East. He just completed installing the terrazzo for the Qatar Airport, the largest airport in the world. Up (and Down) The River: The fabulous view from out DUMBO perch. Another teaches art and works as a potter at her studio in Harlem, just north of Columbia, where she turns out amazing pottery with Japanese influenced glazes. One classmate practiced architecture a few years and then chose to join—as we architects like to call it—“the dark side” and became a developer in Boston. He gets to hire architects and be the client, bringing a level of quality to housing projects of all kinds. Seems Like Old Times: Whooping it up as we discovered photos of ourselves taken 30 years ago in Studio during a break. One classmate brought photos taken of most of us one day in the studio atop Avery Hall, where we spent three very intense years. The prints (from a real camera, long before cell phones!) were laid out on a table and there were whoops of delight as many of us found versions of our younger selves, taken one moment, one day, 30 years ago and quickly forgotten, now suddenly precious. It was 10 p.m. Suddenly the skies darkened, rain started sprinkling the crowd and we retreated under the cover of a roof. It was time to go home.